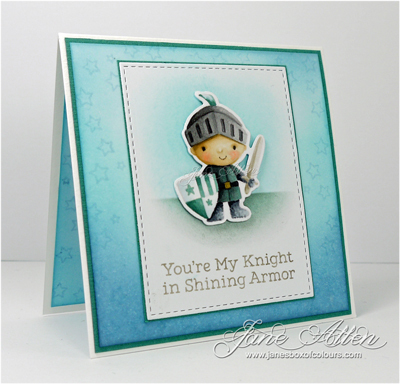 Just a short post today, with a sweet little man dressed as a Knight by My Favorite Things........oh and I think I am finally getting the hang of Distress inks......I used them as a background on the card and to create my own background paper! Colouring Medium: Copic markers, Wink of Stella clear (on helmet), MFT Hybrid Ink: Gravel Grey, Blue Breeze, Bubblegum. Wow Jane.... this is fabulous!!! I just want to stare at this forever Jane. Amazing. Fantastic effect and amazing coloring.